I've dreamed of living on a farm since I was twelve years old. I would have cows, chickens, a luscious garden… life wouldn’t feel like a chore, it would be simple and beautiful. It felt so unattainable growing up in Los Angeles County. The older I got the more and more I wanted that simple lifestyle. I dreaded with a passion commuting to work (in the world’s worst traffic, LA County, baby), day in and day out feeling stressed out of my mind and rushed to work my life away. I began to think, “Is this all my life will be? I worked so hard in school to finished early and get into the workforce, and for what? To feel like this?” I couldn’t accept this to be my everyday – it couldn’t be. Life needs to be more meaningful than traffic, stress and chaos. By this point, my boyfriend and I started discussing our future – where we will go, what we will do, how and why, etc. We thought about going out of state, out of the country, but all seemed too risky for the little money we had. He then mentioned moving to the country with his parents. Initially I thought, “No way! I haven’t lived with parents for almost five years, I can’t go back now!” But, then I began thinking about all the possibilities we will have – no rent or utilities to pay, a dishwasher, washer/dryer, fresh air and SPACE; it seemed like a dream place to begin a new journey in life together. Fast forward a few months, our apartment lease is coming to an end. Do we renew and stick it out another year, or do we take a chance and dive head first into the abyss? Of course, we decided to dive right in! It was very apparent we weren’t one hundred percent happy where we were, and yes, it was hard leaving my mom and friends behind, but we felt this was our chance to do something new with the skills we’ve gained throughout the years – and why not? Why wait? It’s our life, we want to live it in a way that makes us happy and fulfilled. 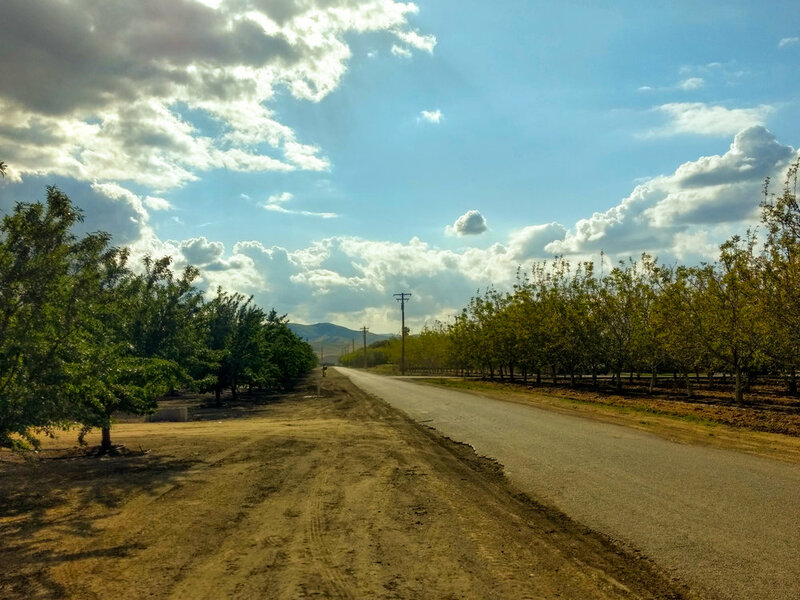 Luckily, driving through gorgeous hills, orchards, vineyards and wide open plains eased my mind like I never felt before – it soothed all my worries and tears away. Five hours later we’ve arrived. All you see is a small town off I-5 and fields of orchards surrounding it. A dream come true, I thought. At night, pure darkness. No lights for miles, you can see the trillions of stars above us clear as day. The sound of frogs, crickets, bats and owls surround you. It’s something you don’t experience in LA, that most people forget about when living in the city; nature living around you – it was utterly beautiful. I adjusted immediately. Outside I found the peace I so desperately needed. I was able to clearly see what I wanted to do, how I was going to do it and created a decisive plan for myself. I didn’t have the chaotic city life pulling me in millions of different directions, distracting me, forcing me to follow a road I didn’t want to follow. Here I found that life doesn’t need to be rushed, that I don’t need to follow the typical route. I can pave my own path even if it doesn’t make me the salary I’m accustomed to making. Life is short and it’s in your hands what you do with it. If you want to live simply like me, it’s entirely possible! Having questioned the status quo, dreaming of a different life and all I had to do to make my thoughts a reality was to move out of LA – take that (important) step back, enjoy the little things life has to offer, and learn to just LIVE. Now three weeks into my new lifestyle, I enjoy walking through the orchard everyday, listening to the wind, the birds, sometimes even tractors driving by; but what I love the most is the simplicity of it all. I can take a deep breath, and just enjoy the moment I’m in. I don’t regret this move, if anything, it has made my life so much clearer. My advice to anyone who is in a rut, feeling lost and unhappy, take that leap into the unknown. I know it’s not easy but it’s well worth it.